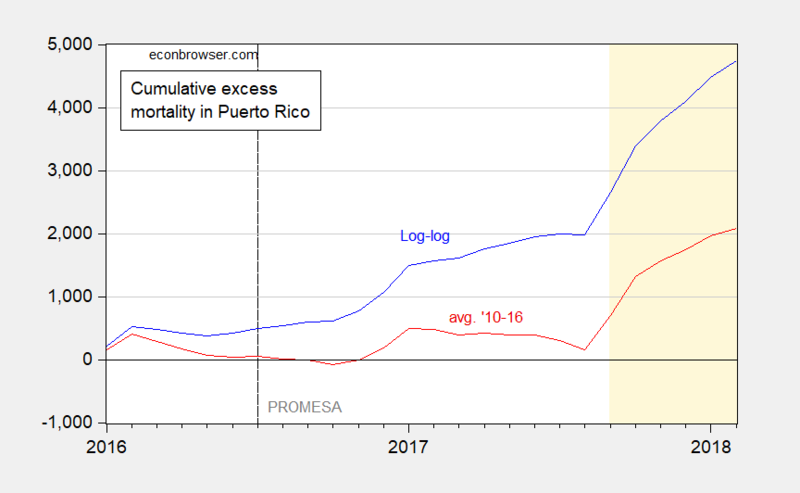 Puerto Rico Austerity-Induced Excess Mortality Exceeds That of Hurricane Maria? 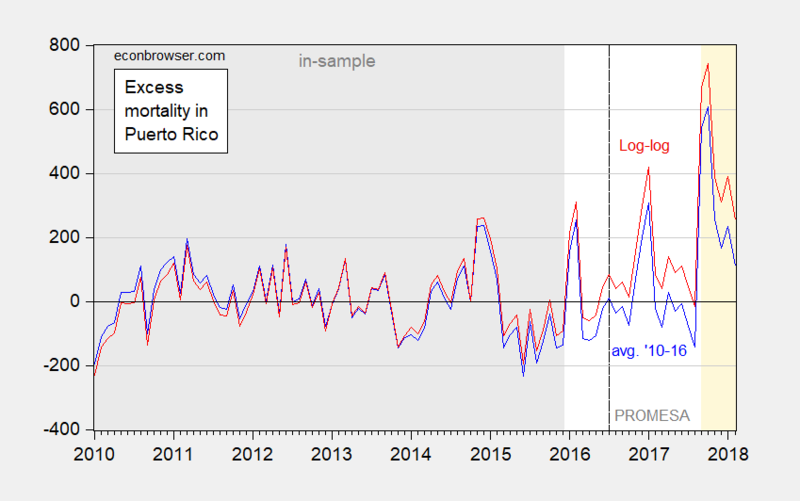 A commentator  has recently concluded that excess mortality due to austerity in Puerto Rico exceeds that attributable to Hurricane Maria and its aftermath. I take issue with that conclusion. First, consider mortality data through February. Figure 1: Mortality per month (blue). Gray denotes in-sample period; orange shading denotes Hurricane Maria and post-hurricane period; dashed line at PROMESA legislation. Source: Santos-Lozada and Howard, 2017, June release of Vital Statistics data. Second, now consider constructing the counterfactual not incorporating austerity measures both before and after PROMESA implementation (legislation passed as of in July 2016, control in effect as of October 2016). I accomplish this by estimating two equations: (1) a simple averaging over the 2010-2015 period, and (2) a log-log OLS regression specification incorporating population estimates (as well as a dummy for October 2014). 2016 seems an appropriate break point for austerity given Brad Setser’s discussion of Puerto Rican finances. These specifications are discussed in this post. I show in Figure 2 the implied excess mortality figures. Figure 2: Excess mortality per month calculated using averages 2010-15 (blue), and population adjusted using 2010-15 sample (red), population is cubic interpolation from IMF World Economic Outlook database data. Gray denotes in-sample period; orange shading denotes Hurricane Maria and post-hurricane period; dashed line at PROMESA legislation. Source: Santos-Lozada and Howard, 2017, June release of Vital Statistics data, IMF WEO April 2018 database, and author’s calculations. Notice in neither case are most of the pre-Maria deviations statistically significant at the 10% msl. In other words, one could not typically reject the null hypothesis of no austerity-induced excess mortality, pre-Maria. Third, it’s instructive to consider excess mortality from 2016M01-2018M08 2017M08, and how it compares to excess mortality to that 2017M09-2018M02. If one assumes zero population change from 2016-17, then one gets the estimate of cumulative deaths (“avg. ’10-’16”) in red line, which indicates minimal impact of austerity. Figure 3: Cumulative excess mortality per month using population adjustment specification (blue) using cubic interpolation of IMF World Economic Outlook database data, and using 2010-15 average (red). Orange shading denotes Hurricane Maria and post-hurricane period; dashed line at PROMESA legislation. Source: Santos-Lozada and Howard, 2017, June release of Vital Statistics data, IMF WEO April 2018 database, and author’s calculations. However, the more realistic assessment relies upon adjusting the counterfactual for population. This leads to the blue line, labeled “log-log”), seemingly verifying the proposition that excess deaths began before the hurricane made landfall. 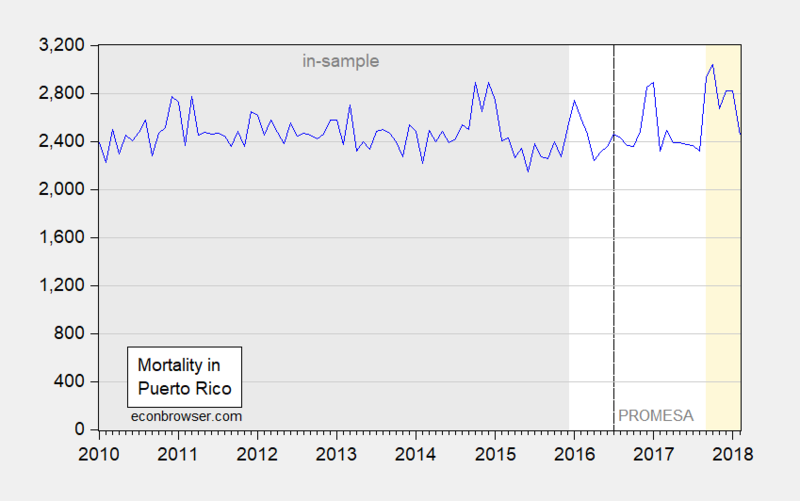 However, interestingly, neither approach directly contradicts the point that most of the excess mortality since 2016M01 is due to the impact of Hurricane Maria. Conclusion: Using statistical analysis, I find the inference that excess deaths due to pre- and post-Maria austerity exceed that of the aftermath of Hurricane Maria is extremely fragile. Buttressing this view, I also find that, using electricity grid outage data reported in Shermeyer (2018), excess mortality as calculated using a population adjustment matches very closely outage data, derived either from PERPA (the public utility) or from Suomi National Polar-orbiting Partnership Visible Infrared Imaging Radiometer Suite (NPP VIIRS). 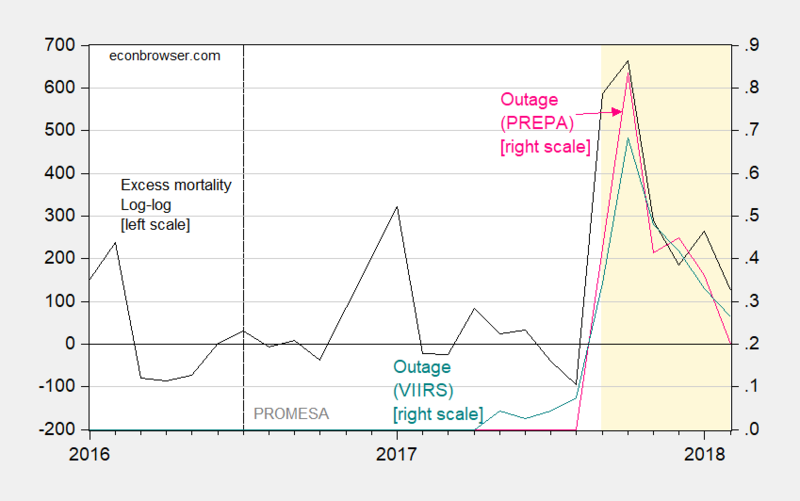 Figure 4: Excess mortality per month using population adjustment specification (black) using cubic interpolation of IMF World Economic Outlook database data, and electricity outages as proportion of total, from PREPA (pink) and from VIIRS as reported in Shermeyer (2018). Orange shading denotes Hurricane Maria and post-hurricane period; dashed line at PROMESA legislation. Source: Santos-Lozada and Howard, 2017, June release of Vital Statistics data, IMF WEO April 2018 database, personal communication from Jacob Shermeyer, and author’s calculations. Mr. Trump has asserted that government ‘did a fantastic job’ with Puerto Rico hurricane response. Update, 9/11 1:15PM: Mr. Trump has repeated the claim that the electric power system was “dead” prior to Hurricane Maria made landfall. Several accounts document he is lying, including Shoot/Forbes. Mortality data here [XLSX], and electricity outage data here [CSV]. This entry was posted on September 10, 2018 by Menzie Chinn. I have pretty much foresworn myself from commenting on this blog anymore [yes, not a deep loss to anyone, insert joke here] due to at least half of the blog hosts’ filtering of topics. But couldn’t resist saying how abundantly impressive Shermeyer’s data is, the amazing way it is compiled and the math and process involved and also am thankful Menzie takes the time and effort to share this with his readers. It’s no “small thing” in my book. Oh gee – Steven Kopits is at it again? I saw his comment and just skipped reading. Thanks for doing the hard work here. Would you post the data and EViews model? It is always instructive to try follow or try to redo your models. Also, could this methodology be used to test “excess” job creation over various administrations? Deaths have an actuarial aspect that perhaps job creation does not have. So, it seems that the definition of excess jobs may be more difficult to determine compared to excess deaths. The question remains as to whether the substandard conditions themselves were responsible for the extent of excess deaths in Puerto Rico following the hurricane; i.e., was the infrastructure so bad that it exacerbated the collapse and resulting deaths? Of course FEMA should have taken this into consideration. It’s not exactly like this hurricane or the existing infrastructure at the time were unknowns. pgl: More on FEMA’s response in minority report, here. The federal government relies heavily on contractors to provide critical goods and services after disasters. The Federal Emergency Management Agency (FEMA) is responsible for the majority of this contracting activity. When hurricanes damage homeowners’ roofs, FEMA provides emergency tarps and sheeting to provide temporary covering until permanent repairs can be made. These forms of temporary roof protection allow hurricane survivors to return to their homes, rather than remaining in temporary shelters or emergency housing programs.  FEMA did not adequately use prepositioned contracts for emergency tarps and sheeting. In response to the 2017 hurricanes, FEMA awarded 14 contracts for emergency tarps and sheeting totaling $206.9 million. FEMA made three of the 14 awards under prepositioned contracts, collectively worth $7.3 million, only 3.5% of the total value of the contracts. The remaining 11 awards – worth a combined $199.6 million – were made under new contracts competed after the 2017 hurricane season began. registered as a federal government contractor the month prior to winning the award. FEMA did not take appropriate steps to assess the contractors’ capabilities and ultimately canceled contracts with both companies due to their failure to deliver.  Many contractors failed to deliver on time. Among the new contracts for tarps or sheeting that were successfully delivered, the average delay between the delivery deadline initially specified in FEMA’s contract solicitation and the actual delivery date was 14 days. Menzie, comparing two DIFFERENT events adds little. If you want to discuss them at least show the detailed differences to which you refer. My comment called out an obvious lie from the left. I agree that the island and FEMA were unprepared. The question is why through several decades no president instructed FEMA to adequately prepare for disasters in U.S. island territories. The same criticism could apply to Hawaii’s situation (volcanoes and typhoons) although Hawaii does have a better infrastructure overall. I think the answer is “out of sight; out of mind”. Why wasn’t there adequate provisioning in New Orleans or Miami which are mainland locations? Part of the problem is materials shelf-life. The other is scope of disaster and materials needed to cope with worst-case situations… imagine several million-plus sq. ft. warehouses on the island of Puerto Rico “just in case”… and make sure they have their own generators and fuel for a few months. I spent several years in logistics management at Ford early in my career and even with sophisticate processes and systems and great facilities, it was difficult to deal with the major one-off crises. It’s easy to sit behind a desk and ask why the operational side isn’t responding well to a major disaster. I think the desk-sitters should get out in the field and see what things are really like and maybe get their hands dirty. It’s not always about money and following orders. MSNBC just interviewed a former FEMA official in light of Florence. He noted something interesting. FEMA itself are not first responders. And when state resources are not enough – he would call on our awesome Defense Department to act. I hope they do for the Carolinas as this one could get bad. He noted quite clearly that Trump did not have any Defense Department resources come to the aid of Puerto Rico. The failure was less FEMA and more our racist and uncaring Commander in Chief. Oh brother. Maybe no Republican President but the history of FEMA has always been that Presidents like Carter, Clinton, and Obama beefed up FEMA whereas Republicans did the opposite. Bruce – you may not like this reality but one has to wonder why he are so keen to excuse Trump’s utter failures. I defer to you on all logistical matters because you have a Ph.D. in logistics management and emergency response whereas I only have an MS in Industrial Management and several years of logistical operations experience… oh, and four years in the military. But I’d like your assessment on why island support, particularly Puerto Rico, is so much easier than stateside support and how the military failed to provide adequate support. …Prior to the arrival of Hurricane Maria, federal personnel were already positioned on Puerto Rico and the U.S. Virgin Islands in response to Hurricane Irma. The U.S. Army Area Support Medical Company and the U.S. Air Force Ground Surgical Team operating in St. Thomas are sheltering aboard the amphibious ship USS Kearsarge and will return to U.S. Virgin Islands after Hurricane Maria passes. IIRC there was a DOD communications unit pre=positioned in PR to assist DOD efforts during and just after the hurricane left. Pgl. you can believe what ever you want, but don’t pass on more TDS-driven misinformation. Bruce Hall Regarding DoD’s response, there are some lessons to be learned. I never understood why DoD stored and palletized a lot of the Class I and Class IV stuff needed for humanitarian operational project stock deployments at (of all places!) Sierra Army Depot in Herlong, CA. Now Sierra is a great place to store vehicles and howitzers and things that are prone to corrosion because Sierra is so dry. But it’s also at the wrong end of the country for most humanitarian disasters and it’s not the most convenient transportation hub. Eventually DoD and FEMA are going to have to adopt the “prepositioned afloat” approach (https://www.globalsecurity.org/military/agency/army/aps-3.htm) that Army and the Marines use to support combat brigades. The APS-3 stocks do have a humanitarian mission, but we really need a joint DoD/FEMA that’s more dedicated to the kinds of humanitarian disasters we’re likely to see as a consequence of global warming in general and ocean warming in particular. As to Trump’s response, I think people would be a little more forgiving if Trump would at least admit that the Maria response was a disaster and not the great success story he still claims. Trump deserves a fair amount of blame, but I’d be inclined to cut him a little more slack if he at least admitted the obvious instead of denying it. Even today he was praising the Maria response. If he truly believes Maria was a success story, then why should we believe he’s learned any lessons that would lead him to want a different response with Hurricane Florence? CoRev Maybe Trump was more concerned about damage from Hurricane Irma because he and his rich friends owned property there. Trump owned an 11 bedroom mansion that survived, but some of his rich friends weren’t so lucky. Still, that much surrounding damage can’t help the property value when you’re trying to sell a $17M mansion. US spent $4 bn in Haiti. Puerto Rico is in line for about $45 bn, best I can tell. bruce, you could try to make that argument with a tropical storm or even category 1 storm. but you cannot make this claim with a major category 4/5 type of storm. even well designed infrastructure is very susceptible to such a storm. bruce, hawaii is very poorly built against typhoons. in fact, the state told people not to go to hurricane shelters in the last storm, because they were only designed to withstand tropical storm force winds. contrary to what has happened this year, hawaii is not typically in the path of many typhoons. I was referring to Hawaii’s harbors, power grid, military presence, and roads (except for mountainous regions, of course). It’s true that typhoons don’t hit Hawaii as often as hurricanes hit Puerto Rico (which is another reason to question why the PR government and residents are not better prepared for these almost-annual eventualities). the island of vieques took a direct hit and was severely damaged by maria. military facilities at that location would not have been helpful immediately after the storm. bad example of unintended consequences. you are implying that hawaii’s infrastructure would fair well with a cat 4 or 5 storm. this is probably a rather poor assumption. the infrastructure has not been built up against such natural disasters. it would also be very susceptible when subject to a direct hit. the islands have not built in the same type of resiliency that exists in south florida and the gulf coast. I think this is also a key takeaway from my analysis, comparing USVI to PR. Both of them took months to get back online. I don’t think you can count on grid resilience for islands exposed to cat 4/5 hurricanes. It’s just the wrong strategy, because these islands are not comparable, in terms of logistics, to Florida or Texas. Therefore, the primary line of defense is mitigation, ie, distributed portable power pre-installed before the hurricane, active removal of vulnerable populations from the island to the US mainland for up to six months, etc. You need a whole different approach. As Baffs notes, it is not apples-to-apples. Well, I thought you would get around to posting on this. Where did you get the 2017 / 2018 monthly death statistics, exactly? There is no link. So, if we look at Figure 1, you can see that the red line starts to deviate from the blue line in early 2016. That is, the 2010-2015 trend no longer holds after 2015, in if you use the 2010-2015 trend line, you are already recording excess deaths in 2016 and 2017 well before the storm. I noted the same thing. Steven Kopits: (1) the deviations using the population adjusted estiamtes are not statistically significant, and (2) the no-population change estimate indicates no pre-Maria austerity induced deaths, even using point estimates. You do realize, Menzie, that you are taking the positions that the massive public service cuts run through by PROMESA had no appreciable effect on mortality rates, ie, that the Obama administration was just blowing smoke when it urged Congress to take immediate action to prevent a humanitarian crisis. I find it more than a bit ironic that I seem to be taking the Democrat line, and you are taking a Republican one. Steven Kopits: I’ll take something in-between the ’10-’15 average and the log-log specification. However, in no case is the Maria-induced deaths greater than the austerity induced deaths, according to my estimates. Hence, I am taking issue with your assertion only that Maria caused fewer deaths than austerity (remember PROMESA is applicable to PR in October 2016). In other words, it’s not a Democratic or Republican position; it’s a statistically-informed position. Yeah, it could be. It comes down to the baseline. If you use 2015 as a baseline for calculating excess deaths, then PROMESA killed more. But it could be lower, sure. If we use the average of the extrapolation for the I-VIII data from 2010-2015, then it’s 1207 PROMESA, 1439 Maria. Maybe that’s probably closer to my sense of it. I believe I may be the first person to take a crack at excess PROMESA deaths. The problem is that this data, if you don’t find it now, will get lost in the wash with the Maria data. I believe there is an uptick in deaths with PROMESA. That story deserves its own exposition, particularly as the IMF sees the PR economy continuing to unwind for the next five years. Congress and the public should take a closer look to see if we can’t do better than the current plan. Steven Kopits: The better way of doing this would be to correlate mortality with health and welfare expenditures, pre-Maria. That requires more detailed budget data than you and I can get easily. But think in making these assessments, it is critical to remember that there is a degree of uncertainty that is associated with sampling error. That is why I stressed that pre-Maria, excess deaths were not statisticially significant except for one observation. Not my fight. It just popped up when I was trying to get the excess deaths number for Maria. You’re saying that PROMESA budget cuts did not lead to increased mortality, and that the Obama administration angst was overblown. And the Republicans thank you. Steven Kopits: I didn’t say austerity didn’t cause excess mortality. I disagreed with your definitive statement that more died from austerity than died from Maria and aftermath. I think that my position is eminently defensible, while your certitude is not. Certitude is irrelevant. What’s relevant is prospective policy. If the lesson is, “Well, PROMESA was no big deal,” then I think I can PROMESA you we’ll see more of it. Personally, I have my doubts about this policy, but again, it’s not in my wheelhouse. I can bring attention to the issue with a headline like “PROMESA killed more Puerto Ricans than Hurricane Maria” and perhaps prompt a few economists to take a closer look at the issue, maybe by contesting the headline. But for me, that’s as far as it goes. Steven Kopits: Well, that’s not policy analysis; that’s journalism in its Hearst-ian form. ok steven, let’s step back and look at the big picture. you have advocated the need for a professional project manager to vet results of a study and their publication. you challenged the harvard study because they had no such person, and you disagreed with the product they produced. the product was the numbers, there was no bias to their results and conclusion. you may have disagreed with those results, but they did not hide or filter their results. you just now advocated the use of studies which have a biased and filtered output. is this what is to be expected when one has a professional project manager, such as yourself, controlling the study? probably why so many bad policies get implemented. this certainly would raise questions about any future studies you were to conduct. integrity counts, steven, and when it is lost, it is difficult to reclaim in the scientific world. Well, you know where I picked it up. Steven Kopits: Sorry, no I don’t. I just looked at the titles of my posts over the past month. Is there any title comparable to your inflammatory one? Perhaps A Time Series Approach to Estimating Excess Mortality Rates in Puerto Rico, Post-Maria? If the Harvard study had never been published, I would have let Milken numbers go without comment. I think the 2,100 number to year-end looks defensible, even if I think my 1,440 number is closer to the mark. A lot depends on how you interpret rather choppy historical mortality data. I’d add that Milken may have access to data which I did not, and that could influence my results. I worked with what I had. By contrast, the Harvard numbers were so blatantly far off as to justify calling out. These numbers were republished hundreds of times to impugn the administration, and then as now, I thought they were fake news. I personally feel leading institutions need to be careful to be neutral in their tone and analysis, and I felt a need to make that point. Now, if you’ve ever written for publication, you know that the story headline does not always comport to the content of the piece. (The title is always decided by the editor or publisher, not the author). The graph in my piece comparing excess deaths of PROMESA and Maria is, I believe, technically correct. I use the 2015 baseline–which is clearly labeled–but in retrospect the choice of baseline was, I think, ‘fragile’, to use Menzie’s words. I spent a good deal of time — most of my Labor Day weekend, actually — running down the Milken numbers best I could. The excess PROMESA deaths really came out as an unintended by-product of the Maria excess death count, and I probably should have let the numbers sit another day, but I had to move on. My mistake. So do you ask permission or forgiveness, Baffs? This time I chose forgiveness. Mea culpa. Steven Kopits: I’ve published over 70 peer reviewed journal articles. In not one single case do I recall having my title choice over-ridden. If I write for a newspaper or a non-peer reviewed serial, yes. But not a journal article. And if it’s your own blog, you have complete control over the title, don’t you? Well, I publish in the main stream media, mostly. The title is always at the discretion of the editor, whether that’s at CNBC or The Hill, to name just two. Sometimes they go with my title, sometimes they don’t. But it goes without saying that the title is the prerogative of the publishing entity. And why is that? Because they are looking for eyeballs. And, yes, I do have complete control over the title. And yes, I got the eyeballs. Steven Kopits: Well, there you have it — you have a different utility function than I do. I would weight credibility over eyeballs. steven, you are mixing up events. the harvard study was neutral in their analysis-you simply disagreed with the numbers that analysis produced. they were very transparent about their methodology, sources and errors. a scientific study. they are not responsible for the tone of the “republished” articles-those articles are out of their control. in fact, you did well to articulate why such articles tend to not have a neutral tone and biased analysis. don’t blame the harvard folks for somebody elses publication. Right, Baffs, but the way that reads in the heartland is that Harvard lied to us, public health professionals cannot be trusted and we should not listen to what they say. It’s hard enough to do certain things with the Republican Party as it stands today. Burning a big chunk of credibility with the public is incredibly foolish and potentially disastrous. The fact that someone dislikes — or even loathes — Trump is not sufficient cause to politicize a finding (except on econ blogs). That’s the point I am trying to make. Steven Kopits: Let’s apply your standard to you. Harvard’s point estimate is closer to PR government’s estimate than your absolute 200-400, and in fact Harvard’s confidence interval encompasses the current PR government’s estimate. And you say the Harvard SPH is lying? But I’m working on a comprehensive analysis of the extant serious studies. You’ll then see how real policy analysis/academic analysis is conducted. Absolutely. My utility function is bringing to the attention of the economics community that Federal government policy in Puerto Rico — however, well-intentioned — may be causing a material increase in mortality and deserves a closer look. You are animated by egalitarianism and a loathing of Trump. I get that. I think that causes you to over-personalize structural issues, miss the bigger picture, and fail to engage with life-and-death topics which don’t easily fit into your preconceptions. You’re in essence arguing that I should have waited on the numbers to settle before I published and used a less flamboyant title which you would not have reviewed. If I have to choose between protecting people and ideology, it will be the former. Yes, it’s important to be numbers-driven to determine the possible effective and efficient points of intervention (sometimes there aren’t any). But at the end of the day, I’m not going to let anyone hang out to dry if there is a reasonable chance to help, regardless of which ideology I have to use. So, do I deserve a slap on the wrist for using a ‘fragile’ baseline — although it was fully disclosed? I think I do. I should have used the regression values, rather than the cycle minimum. But I am sorry that we discussed the topic here? No, I am not. i don’t read that at all steven. but from your response, you seem to be implying it is more important to bias and politicize a report to get an action, than to present an unbiased report of the numbers. that is what the harvard study conducted. and as time goes on, it appears their results become more realistic by the day. i for one am glad the harvard folks provided an unbiased study for publication. i don’t need a program manager filtering results to get a desired public policy implemented. we should not work that way. First, and for the ninth time, 200-400 is not my estimate. My current estimate is 1439, my prior estimate was 1400 for the Sept. 1 (Sept 20) – Dec. 31, 2017 period. I don’t think the Harvard team lied. I think, however, there was a catastrophic failure of project management, which consisted of 1) failure to confirm the 38 fatalities with authorities and 2) failure to reconcile survey deaths to known actual deaths. The Harvard number was reprinted over and over as fact. It was used by the mainstream media to impugn the administration. If you’re Cape Cod Community College, who cares? But if you’re Harvard and the NJEM, it’s a big deal. So if Moses said, “Menzie killed six people with a confidence interval of +/-7,” that one thing. If the President of the University of Wisconsin said that, it’s another. And if the Milwaukee Journal Sentinel publishes: “UW Economist Kills Six”, but adds in paragraph eight that, “some experts note the confidence interval is +/-7”, you know, that’s a very big deal. So before the UW President says anything, I’d tell him, “Forget the CI. You have the bodies you can count. That’s it.” But let’s suppose he nevertheless said, “Our mean estimate is that Menzie killed six people. Of course, it could be more or less, however, this number is likely to be an underestimate.” If he came back later and said, “Well, I didn’t really accuse Menzie of murder, because, you know, CI.” Well, that’s not going to fly, is it? Did he lie? Absolutely not. Will most everyone think he lied? Absolutely. Will everyone think him irresponsible and untrustworthy? Without question. Will many question his motivation? Sure. Would he lose his job? Deservedly so. Even though he didn’t lie. That’s the point I am making. And, yes, you can use that in your statistics class. I didn’t present a biased number. That was my best estimate at the time. If you do analysis, though, sometimes it takes time for numbers to settle. I used it because I thought the linear trend, which was declining, would yield an even lower number and hence a higher PROMESA death count. (It doesn’t.) But I didn’t check, and I should have. When Menzie flagged it, it had been nagging me. So, yeah, my mistake. This rate yielded a total of 4645 excess deaths during this period (95% CI, 793 to 8498), equivalent to a 62% increase in the mortality rate as compared with the same period in 2016. However, this number is likely to be an underestimate because of survivor bias. Can you use a ‘yellow journalism’ headline to capture busy readers’ attention? I think you can, within limits. Can you use a baseline which is true and disclosed but maybe not the best baseline? Arguably, yes, but ordinarily I am trying to give my readers my best understanding of events, so I would typically correct that if it came to my attention. Which I did. “excess mortality from 2016M01-2018M08” 2018 M08? Is that date right? Steven Kopits: Sorry, no … to 2017M08. Will fix. President Trump just addressed the press about preparing for Florence. I hope we are prepared but Trump just had to turn pathetic. First he bragged about the great job done in Houston and Florida last year as if Maria never happened. But a reporter asked him about Puerto Rico. The answer of course from Trump that his Administration did the best job ever in Puerto Rico. Delusional or dishonest? You choose. the maria disaster was bad, but unavoidable. not much can be done to prevent large scale damage from a major hurricane direct strike. however, these discussions reveal that austerity is a preventable disaster. those who tried to impose austerity as a solution should be ashamed of the humanitarian damage they conducted, in the name of an ideology. Bruce Hall in his attempt to defend Trump cites someone criticizing a 2016 Obama budget that would have cut FEMA funds. Fine but what did Trump do when he took office? Increase FEMA funding? No – he proposed even more cuts to FEMA’s budget. Some defense Bruce! I have tried to ascertain exactly what Trump did wrong. The normal Federal govt share is 75%. This was six days after the hurricane, and the coverage was later extended. In terms of power restoration, certainly through year-end, the Virgin Islands does not seem to have fared better than Puerto Rico. Business Insider states: “A faster, stronger response would have prevented some of those deaths.” I am not entirely convinced. The comps of PR and the USVI suggest that a major hurricane will just wipe out the grid, and no matter what, it will take months to rebuild. One could criticize the President for a lack of awareness of excess deaths due to power shortages, but I am unaware that such a calculation was ever made for a hurricane before. Steven Kopits: As Trump prepares to deploy military assets to assist in the current situation, you ask this? You might remember Mr. Trump’s first budget proposal was to cut FEMA funds. In addition, many positions in FEMA are currently under “acting” officials, meaning no policy level approved individuals head these offices. That also highlights the priority Mr. Trump accords disaster preparedness. Almost all the warehouses were empty, so when we hit, the amount of available supplies – either generators, blue roof material or whatever it might be – were just not there to be able to respond in an effort that would’ve probably been something that could’ve got us more of a jumpstart. Seriously? The list could go on and on for a long time. An easier task – what did he do right? NOTHING! Seriously Steven – how much is Trump paying you for this stuff? Of course we do see the New York folks going down to PR the day after Maria. New York State did more than the Trump Administration. Go figure. Pgl, you made that statement in one of the previous articles, and NEVER showed a link. Show us how NY responded the day after Mazris. CoRev proves once again he cannot follow a discussion. Steven provided the link dude. Do pay attention someday. i have been arguing this point for months steven, glad you finally begin to agree. once you accept this condition, blaming the failed infrastructure on poor condition, etc is really a nonissue. it would have been severely damaged even if it were not in poor condition. when planning for a major hurricane recovery, we need to plan on rebuilding much of this vital infrastructure from the beginning. it just seems to be a fact of life in high risk hurricane locations, especially those areas with mountains which produce flooding and landslides, or subject to large amounts of storm surge. those are very difficult to predict and design against. “it would have been severely damaged even if it were not in poor condition”. My dad’s first job when he returned from serving in WWII was a line man for Georgia Power. I would venture to say I know more about repairing electricity after a major storm than anyone here. And you are right – it does not matter what the situation was before Maria as Maria wiped out all of the lines. This excuse from Trump is beyond stupid. Now I also know that major damage might require weeks to repair. But after Maria, Puerto Rico had to wait for months. Inexcusable. And to those who are trying to excuse Trump’s incompetence, let me add I have friends with relatives in Puerto Rico who died as a result of this incompetence. Your excuses are even more disgusting than Trump’s incompetence. I understand that the President has a true talent for alienating people. However, if we separate his rhetoric from the actual response, I think it harder to establish the President’s personal culpability. OK, he dragged his feet. On the other hand, he signed an order to pick up 100% — not the usual 75% — of the A-B hurricane costs within 6 days of the hurricane. That doesn’t suggest some sort of institutional meanness to me. Of greater interest, I think, it the C-G permanent infrastructure reconstruction aid. This request was not filed by the PR government until Oct. 2, and then agreed as an Alternative Procedure under Section 428 of the Stafford Act at the end of October. This was delayed by about three weeks compared to the USVI. The use of section 428 — a piece of legislation signed under the Obama administration — has slowed distribution of funds to PR. But it has appeal. For example, PREPA’s power plants are oil fired. Today, per btu, oil costs about 4.3x more than natural gas. Thus, PR had both high electricity rates and low efficiency (typical SOE stuff). No one would rebuild an oil-fired plant today if you had the chance to convert to a modern gas-fired alternative. Of course, that involves all kinds of gas infrastructure that never existed in PR. So it might make a lot more sense to convert rebuilding aid into something more like a block grant with the island taking some of the excess cost onto its own books. Don’t know. Perhaps others have more insight into this. It is relatively clear, however, that the PR government has minimal credibility with the Trump administration. I also think that all discussions with PR are colored by the island’s massive debt, which ultimately hangs as a contingent liability over the US Federal budget. Pgl claims: “Of course we do see the New York folks going down to PR the day after MariaNew York State did more than the Trump Administration. Go figure.” Absurd exaggeration? You choose. I’m sorry, but for all the exaggerations we see about Trump and the administration’s Maria response, this kind of commentary is ludicrous. Pre-positioned troops and a hospital ship, onsite on PR DOD communications personnel were all available in the Caribbean. This is just another example of TDS driven desperation. NYPA was there the day after Maria. Trump’s people were not there for weeks if not months. If you do not understand that is clearly more, then we now can all understand why you are so lost on every other topic. “As Irma relief efforts continued ashore, the meteorology professionals on Kearsarge began to monitor the formation of Hurricane Maria and raised the alarm before anyone else. As Maria began her march, the LCUs pulled relief workers, support personnel, and equipment off the islands and transported them to Kearsarge. Kearsarge then moved south of VIPR to avoid the approaching storm to ensure that ship, people, and equipment would be ready to respond after the storm. Remember, that’s compared to the NY response team of 10-12 NYPA folks to assess grid damage, a handful of drone pilots, and a clueless NY Governor arriving the day after the Kerarsarge and the remaining units of CTF-189 had already gone to work in Puerto Rico. Why are you continuing to lie? CoRev This was a pretty anemic response. Let’s put this in perspective. Your link refers to a couple of small ships that delivered stuff largely by a few dozen helicopters. And after four months they provided less than 1500 tons of supplies. Now compare this to the number of prepo ships (16 large ships) the Army provides to support two brigades (~6,000 personnel) for 15 days. 2slugs, inadequate comparison. Are you suggesting the USA prepo ships be used? The response was to pgl lie, but if you want to support him be careful. Go read the GAO Report in Menzie’s later comment thread. We do need to update what we learnt way back in our Uni days on econometrics. I see – just make sure those Hispanics are not in White America when the next hurricane hits – wherever it hits. If the Hispanic dies, not Trump’s problem! Pgl, Oh My Gosh, they are moving well LESS than 0.10% of the FEMA budget. It’s a catastrophe! But put this all together and we are talking REAL money. Which led to the deaths of real people. Oh wait – Hispanic people. Now I get why this does bother you! pgl: If it isn’t obvious before, it should be by now: if you are not Caucasian, nor English speaking, you do not count as a “real American” in Mr. Trump’s mind. If you are non-American and from Norway, you are human; non-American but from a “s***hole” country, you are subhuman. It’s a simple algorithm, for a simple man. Pgl, still misunderstanding the Federal budgeting process cites the President’s proposed budget and not the actual Congressional FEMA appropriation. It’s Ok to be ignorant of the Federal Budgeting process. Most are, but to blame everything on Trump is a sign of TDS, another aberrant behavior. I just heard someone claim that last year’s hurricanes cost us $350 billion – which would put their damage near 2% of GDP. That is a yuuuge cost brought to us by those climate change deniers in Washington DC. pgl Trump is only a climate change denier when he’s talking to his base. When it comes to his golf course in Ireland, that’s a different story. There he wants to build a seawall because of the rise in sea level. Trump’s motto: A foolish consistency is the hobgoblin of little minds. 2slugs, let me provide the scientific definition climate change so that we can tell what and how badly he is denying reality. Climate change is a change in the statistical distribution of weather patterns when that change lasts for an extended period of time (i.e., decades to millions of years). Climate change may refer to a change in average weather conditions, or in the time variation of weather around longer-term average conditions (i.e., more or fewer extreme weather events).” Almost no one denies this! a change in global or regional climate patterns, in particular a change apparent from the mid to late 20th century onwards and attributed largely to the increased levels of atmospheric carbon dioxide produced by the use of fossil fuels.” Many disagree with this definition, because it ignores millions (if not billions) of years the planet’s history. Wiki? I think that it is from the IPCC and copied to wiki. If you want to use the NOAA definition as you truncated OK. Now lets pick several 30 year periods for comparison. even corevs definition includes the range of decades, yet he apparently is unwilling to accept this time period. must be a hobgoblin of a little mind. Baffled, what are you now talking about? “change lasts for an extended period of time (i.e. decades to millions of years). ” 30 years. 3 decades, is commonly considered the normal and even minimum period for studying climate change. “. The atmospheric component of the climate system most obviously characterises climate; climate is often deﬁned as ‘average weather’. Climate is usually described in terms of the mean and variability of temperature, precipitation and wind over a period of time, ranging from months to millions of years (the classical period is 30 years). ” From the IPCC FAQ pamphlet. Even 30 year periods are too short to even ID most of the climate cycles. I will repeat what we see and are confident in: Short cycles – daily long cycles – Glacials. corev, your response is incoherent.